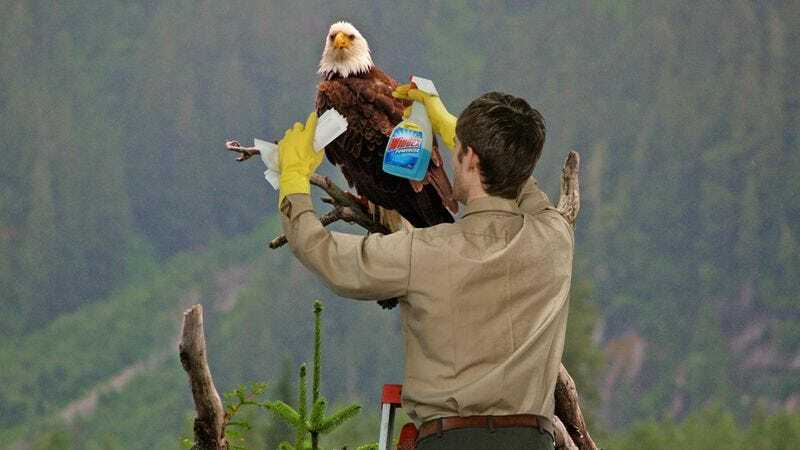 Each bald eagle receives an annual head-rewhitening. WASHINGTON—With their current condition “marginally breathtaking at best,” America’s national parks will be closed this week for their exhaustive annual cleaning and remajestification, the U.S. Department of the Interior announced Monday. Each year, all 84.4 million acres of land overseen by the National Park Service are thoroughly scrubbed, tidied, and restored to a maximally picturesque summertime state. According to officials, the weeklong process includes extensive brook re-babbling, the application of new bark to some 37,000 giant redwood trees, litter removal, and the sharpening and re-snowcapping of every peak in the Rockies. In addition, some 4.7 billion stones will be polished to their original sheen, and more than 23 million species of indigenous wildlife will be washed and primped by hand. Bark-washing crews work round-the-clock so that, come reopening, the giant redwoods will really pop. McCoy added that by August his crew is usually forced to discharge canisters of scented evergreen into the breeze to induce an adequate sense of calm and wonderment. The annual program began in 1947, when Congress established a $400 million fund “for restoring the majesty of America’s natural heritage so often as it becomes necessary.” Initially, expenditures were limited to sky-bluification and the regoldenizing of sunsets, but today the budget cover dozens of projects: specialized tools to sharpen moose antlers, spray tanks to enhance the mists surrounding waterfalls and the beads of moisture that appear on spiderwebs, and miniature loofahs for buffing blades of grass. Sources confirmed the U.S. government makes $30 million each year licensing its proprietary morning-dew recipe to other nations, earnings it then devotes toward modernizing the infrastructure of America’s natural beauty. Regular patrons of the nation’s parks said they were looking forward to the reopening, complaining that by late spring, the deteriorated grandeur makes it impossible to experience any kind of tranquility in nature. National Park Service director Jonathan Jarvis said many Americans take their country’s natural beauty for granted and imagine that it is somehow self-maintaining.